BREAKDOWN callouts to motorists whose vehicles have been damaged by potholes have risen by almost a quarter in a year, the RAC said. 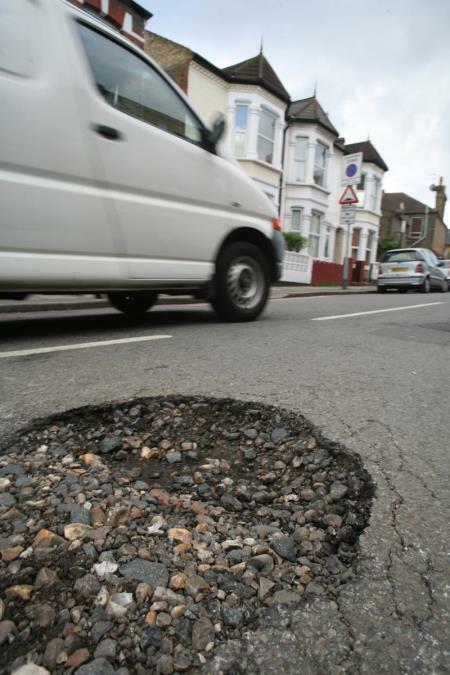 There were more than 25,000 incidents last year involving damaged suspensions, wheels and shock absorbers, figures released by the motoring organisation to coincide with the second National Pothole Day show. Drivers in East Anglia made the most calls for help (4,547), but the largest rise in callouts over the past year was in the south east of England where the increase was 62%, to 2,686. The north east of England saw callouts rise by almost a third to 3,783, while incidents in Scotland increased by more than a quarter to 2,537. The biggest headache for drivers was damaged suspension springs, with 42% more incidents reported last year compared with 2014. The RAC described the rise in callouts as worrying. Chief engineer David Bizley said: "Potholes can wreak havoc with vehicles and are therefore understandably hated by motorists. "It is very worrying that our patrols have dealt with more pothole-related breakdowns in 2015 than they did the year before because we did not experience a particularly cold winter in either year." Recently announced investment should help improve the condition of Britain's roads but there is still a way to go, Mr Bizley said. Some local authorities have invested more in road maintenance to address the backlog but problems experienced, even in mild weather, suggest the fight against potholes is being lost, he added. "We shall only win the battle once sufficient preventative road surface maintenance is undertaken to prevent potholes appearing when the first bad weather arrives. "On top of the £6 billion already promised, the Chancellor made available further funds in the Autumn Statement and whilst this is still not enough to meet the shortfall, it may hopefully mean we will see a decline in 'pothole generated breakdowns' this time next year." Drivers are being encouraged to report potholes using the RAC Report Pothole app.